In the theatre, there is a long-time tradition of cast and crew signing their name, role they played, and show title to the bricks and walls of the stage and backstage at theatres around the world. This has been happening as long as can be remembered and just such a local proof was “unearthed” recently at our own Cutting Hall Performing Arts Center. The cyclorama wall (back wall of the stage), known just as the Cyc, for many years was covered with drywall and painted an off-white paint with a very slight tinge of blue. This allows the various colors of the Cyc lights to vividly, or subtly, illuminate the back wall, as dictated by the lighting designer for any particular performance. As drywall is not a strong durable surface when scenery or an AOC (Actor Out of Control) smashes into it, the wall had been damaged and patched so much over the years that there was probably more patching than original drywall. This August, the project of replacing the drywall with harder, more durable plywood was undertaken. When the drywall was removed, it revealed the raw bricks of the wall structure with a special surprise. 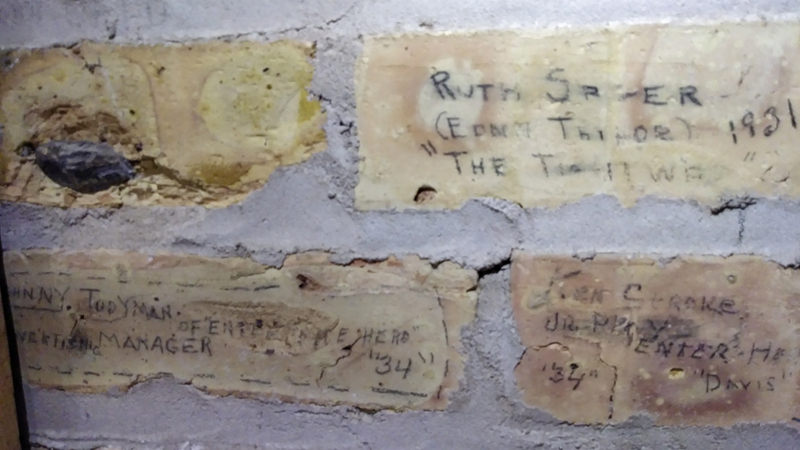 Almost every brick contained at least one signature, note, or message from across the many decades of Cutting Hall’s 90 years. Although many were illegible, due to the ink or pencil fading, messages dating from 1931 to the 1970’s were observed. As in the early days of Cutting Hall the ink probably did not adhere well to the rough surface of the bricks, most of the writings were scribed in pencil. Some show titles etched onto the bricks were recognizable, but many were far more obscure, never to ring a bell in the consciousness of a modern theatre goer. A special thank you goes out to Palatine Park District Trades Foreman Tony Olhava and his crew for the fine work done on the replacement of the wall surface. The rather large time capsule is now resealed to be unveiled only to future generations. J. Spencer Greene, “Jeff,” has been the Theatre Coordinator for Palatine Park District, since 2001, where he manages all aspects of Cutting Hall Performing Arts Center and Fred P. Hall Amphitheater. Jeff has a long background in both professional and educational theatre and film, garnering numerous awards from the Illinois Theatre Association, Chicago’s Jeff Awards, and American Association of Community Theatres.